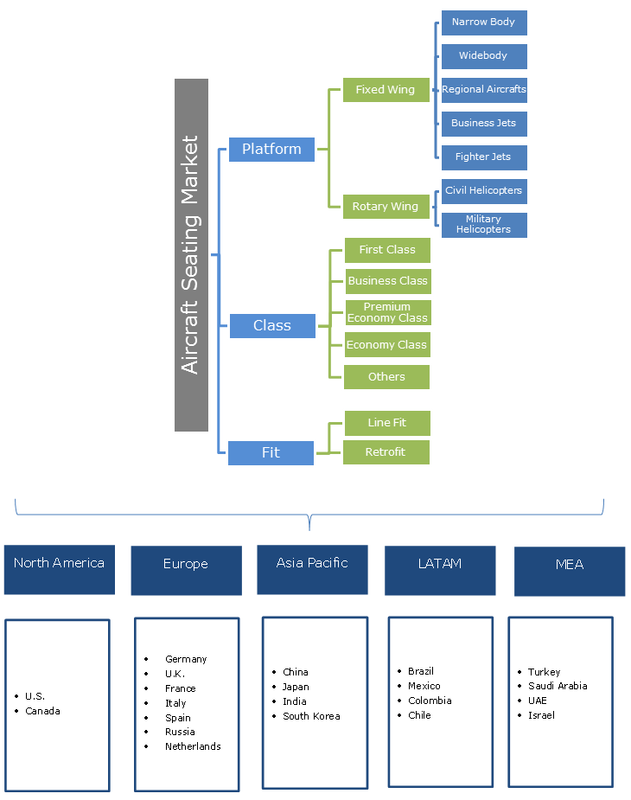 Aircraft Seating Market size valued at USD 12 billion in 2018 and is estimated to exhibit over 6% CAGR from 2019 to 2025. 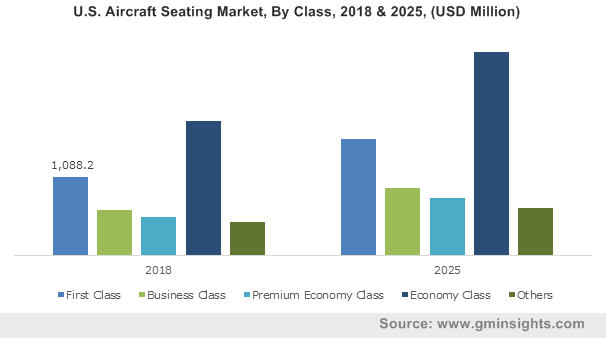 Increasing aircraft deliveries, business tourism activities, and procurement of fighter jets are strengthening the aircraft seating market share. Higher demand for aircraft seats is majorly driven by efficient design of aircraft seating system ensuring maximum seating capacity, economic growth in developing nations along with rising per-capita income, and higher demand for economy class airplane seats. Rising focus of airline operators on maintaining passenger retention and brand image has led to frequent replacement and refurbishment of aircraft seats. Continuous development in design as per the Civil Aviation Authority (CAA) guidelines concerning aircraft seat spacing is projected to offer rapid growth opportunities for the aircraft seating market over the forecast period. However, higher investments in maintenance and longer clearance periods of cabin interiors are restraining the business growth. Passengers are expecting the highest degree of comfort while traveling to long-distances. To enhance the seating comfort levels, industry participants are providing slimmer seats with modular design and ergonomic features to boost the passenger traveling experience. Aircraft seating companies are also offering solutions that are scalable to both narrow body and widebody airplanes. Additionally, stringent government regulations pertaining to passenger safety has improved the safety provisions for aircraft seats. Proliferating adoption of advanced lightweight aircraft seats is among the key aspects that has gained importance among the industry participants. Several aircraft manufacturers are utilizing advanced lightweight material for design and development. Improved weight management in aircraft ensure the efficient ratio optimization between payload and range that results in low-fuel consumption. The demand to increase the fuel economy in modern aircrafts is influencing the lightweight material adoption in aircraft seating that will provide rapid growth prospects till 2025. Industry participants are making significant investment to improve seating arrangement in cabin interior that are propelling the aircraft seating market size. Some aircraft manufacturers are providing business class seating by adding extra seating row, whereas others are launching new seating design in aircrafts. In addition, manufacturers are engaged in R&D to reduce complexities in procurement of technical textiles and raw fabrics, providing improvement in production quality of airplane seats. Higher usage of hybrid composite materials in aircraft seats manufacturing is expected to offer easier manufacturing process to OEMs. Aircraft seating market for fixed wing segment will exhibit significant growth over the forecast period. This can be attributed to increasing narrow body deliveries across the globe due to upsurge of middle class in emerging countries coupled with economical airfares. According to the Centre for Aviation (CAPA), in November 2018, Boeing accounted for larger share in narrow-body segment as compared to widebody aircraft that is fuelling the segment share. Further, leading industry participants are providing advanced seating system to fixed-wing airline operators. Rotary wing accounted for a considerable volume share in the aircraft seating market on account of increasing demand of helicopters in firefighting, air ambulance, and passenger transport. Growing seating capacity of helicopters with air-conditioned cabin are accelerating the market growth. For instance, Airbus H225 is configured with 18 seats that combines the capability of carrying 19 passengers. Business class in aircraft seating market will showcase a considerable revenue share over the study timeframe. This can be credited to emergence of high net worth individuals, opening newer direct markets, favourable trade policies, and rising import and export activities across the globe. Growing demand for advanced luxurious seating arrangements in business class aircraft will further enhance the segment growth. Economy class accounted for a significant revenue share in the aircraft seating market owing to rising per-capita income along with growing middle-class population in emerging countries. In addition, manufacturers are increasing the seating capacity of economy class aircraft. Most of the manufacturers are constantly engaged in low-cost production strategy to reduce the airfare that is significantly strengthening the segment penetration. Line fit segment accounted for a significant volume share in the aircraft seating market owing to increasing aircraft orders and deliveries coupled with the installation of advanced seating systems in aircraft. Further, enhancement in airspace infrastructure has been instrumental in rising air passenger traffic across the globe that is escalating the newer aircraft deliveries. Prominent aircraft manufacturers are involved in approving seating system of industry participants for line fit as per the government regulations. Retrofit segment will showcase considerable growth over the study timeframe on account of upgradation of aircrafts seating systems during maintenance programs. The airlines operators are constantly retrofitting the aging commercial fleets to protect seating damages and improve the passenger safety. Aircraft companies are establishing long-term contract with MRO companies to provide aftermarket effective solutions. 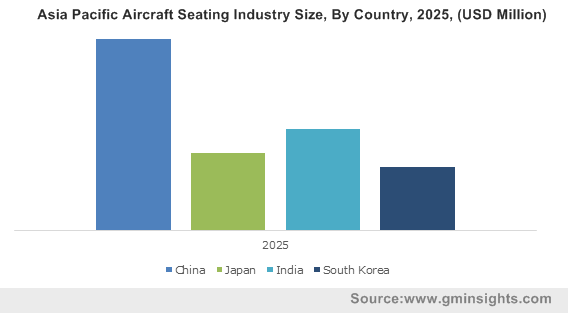 Asia Pacific will exhibit significant growth in the aircraft seating market over the study timeframe owing to increasing air passenger traffic coupled with growing commercial aviation industry. The significant growth of commercial aviation industry is caused by rising disposable income, regional economic expansion, and growing tourism sector which in turn will further escalate the aircraft demand in emerging economies. North America hold substantial revenue share over the projected period on account of presence of major aircraft manufacturers including Boeing and Bombardier. Rising aviation industry in the U.S along with increased procurement of fighter jets for military modernization are accelerating the aircraft seating demand over the forecast period. Further, prominent industry participants in region are involved in innovating the advanced seating system for aircrafts. Prominent players in the aircraft seating market are Zodiac Aerospace, Collins Aerospace, Geven, Recaro Aircraft Seating, JAMCO, Lufthansa Technik, Stelia Aerospace, Acro Aircraft Seating, Aviointeriors, Mirus Aircraft Seating, and Thompson Aero Seating. Airline operators are establishing strategic agreement with industry participants to install advanced seating in their aircraft. For instance, in April 2018, Lufthansa Group announced the installation of newer Geven ESSENZA seat for its Austrian Airlines, SWISS A320, Lufthansa, and A321neo fleet that enabled company to enhance its product portfolio. Most manufacturers are engaged in finding the lightweight solution for aircraft seating system. Stringent government regulation regarding aircraft seating management is fuelling the aircraft seating market expansion till 2025. Regulatory bodies such as Federal Aviation Administration (FAA) regulates the installation, maintenance, and overhaul of aircraft seating. Leading industry players are adopting major strategies including partnerships & agreements, expansion & collaboration, and merger & acquisition to increase their revenue and enhance geographical expansion. For instance, In January 2018, Boeing announced a joint venture with Adient for the development of airplane seats.